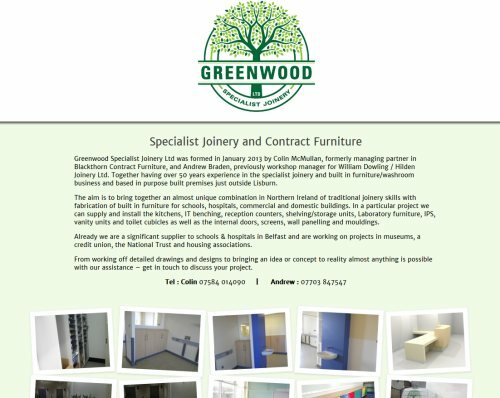 Combining fabrication of built furniture with traditional joinery skills, Greenwood Specialist Joinery Ltd is the natural choice for schools, hospitals, commercial and domestic internal joinery. Recently Greenwood asked us to produce a new website for them to showcase their work. Because they are such a young company the directors know that their website will need to change and evolve as the company grows so choosing Ardnet as their website provider was the natural choice. We won’t mind working on small projects and build every site with expansion in mind so that in the future if you want to add new pages and content it won’t involve a major structural redesign.